Arthur and Percy had a little something of turkey giblets for afternoon tea. They also had a little game from the game pie that Tony is making, for second breakfast. This, of course, in addition to ordinary breakfast and tea. It has been a busy day, so much so that as a special concession, Arthur’s second little something was served to him whilst on Boiler Duty, which is of course not usually allowed, and Percy’s whilst on Greenhouse Duty. 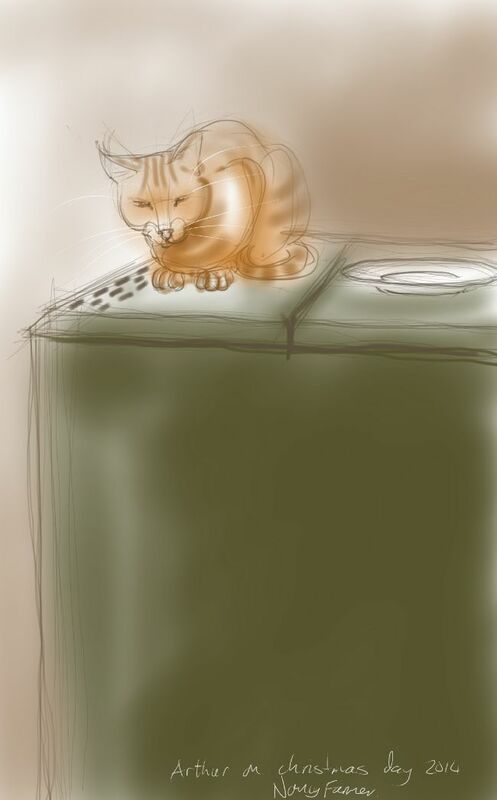 This entry was posted in Cats and tagged art, arthur cat, cat, cat drawing, cat-of-the-day, digital sketch, drawing, ginger cat, illustration, life drawing on December 25, 2014 by Nancy Farmer.